John Kerry, David Alston, Danny Barbiero, Douglas Brinkley, Harvey Bundy, Max Cleland, Bester Cram, Chris Gregory, Richard Holbrooke, Bob Kerrey, Michael Medeiros, Thomas Oliphant, Neil Sheehan, Fred Short. Going Upriver: The Long War of John Kerry is a feature length documentary about character and moral leadership during a time of national crisis. Loosely based on the best-selling book Tour of Duty by Douglas Brinkley, Going Upriver examines the story of John Kerry and the key events that made him a national figure and the man he is today. The film places particular emphasis on his bravery during the Vietnam War and his courageous opposition to the war upon his return. 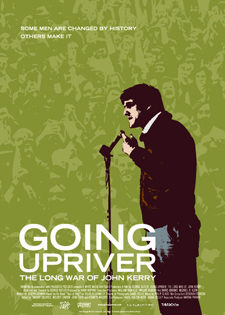 Going Upriver: The Long War of John Kerry is an extraordinary inside look at a politician, where he has come from, and how these roots have driven him forward in his public life. As a Vietnam War hero and subsequent activist, his story is a worthy subject for an important film about a defining era in America’s past, and how it influenced a man and his dedication to the democratic process. This is, therefore, also the story of an American generation that came of age in the war-torn sixties, and has now come to prominence at the beginning of this century-when issues of war, and their historic resonance for a new generation of leaders, hold center stage. Acclaimed director George Butler has known Senator Kerry since 1964 and in 1969 began photographing him, in an effort to document his life and career. Using his unique collection of images, the film weaves together Butler’s photography with archival materia, interviews with Kerry’s closest associates as well as contemporary footage of him at home and abroad. As with his films Pumping Iron and The Endurance: Shackleton’s Legendary Antartic Expedition, the filmmaker prove himself as a master at portraying American men affected by and effective history. Produced by George Butler, Mark Hopkins. Executive Producers: William Samuels, Vincent Roberti, Marc Abrams, Michael R. Klein. Based on the book “Tour of Duty” by Douglas Brinkley. Director of Photography Sandi Sissel, A.S.C, Jules Labarthe. Edited by Timothy Squyres, Melody London, Jean Tsien, Kenneth Wachtel. Co-Producers: Daniel Holton-Roth, Sarah Scully. Archive Film/Stills Producer: Prudence Arndt.